Kids love family game night! But, as you know, it doesn’t have to be night for them to be up for a game. They just want to spend time with mom and dad and/or their siblings. Many of the games listed below are not only fun, but they’re educational, too. Kids will practice their colors, ABC’s, numbers, counting, and visual discrimination skills. This is a great way to sneak in a little learning in the midst of family fun! Let’s Go Fishin’ – This was my oldest son’s favorite game when he was younger. As long as we had fresh batteries, we played this fun fishing game several times a week. As the “pond” spins, the fish open and close their mouths. Kids get to brush up on their motor skills as they try to “fish” the fish out of the pond. Hungry, Hungry Hippos – This game is a classic! I remember playing it when I was a kid. Kids have a great time making their hippos gobble the marbles! Chutes and Ladders – Kids will practice their counting skills as the climb up and slide down this game board. There’s even a Super Heroes version! Memory – Kids will sharpen their visual discrimination skills as they flip the cards looking for matches. In addition to the “original” version shown above, there are a variety of pop culture versions like Minions, Disney Classic Characters, Marvel, Frozen, and more. Candy Land – Players race to the castle in this sweet board game that’s perfect for preschoolers since no reading is required. Your kids might also enjoy the Disney Princess or Minnie Mouse’s Sweet Treats versions. Hi Ho Cherry-O – Kids spin the spinner and “pick” the correct number of cherries off the tree. Watch out for the dog who knocks the basket over and the bird who eats the berries. Kids will have so much fun they won’t even know they’re adding and subtracting. Cootie – Kids will giggle through this game as they build their silly little cooties! This game is perfect for preschoolers, because there is no reading involved. In this same game series, your kids might also enjoy Ants in the Pants, Don’t Break the Ice, and Don’t Spill the Beans. Go Fish! – Kids will practice number recognition, making pairs, and matching as you play a round or two of Go Fish with these fishy cards. Here’s a fun alphabet version, too. 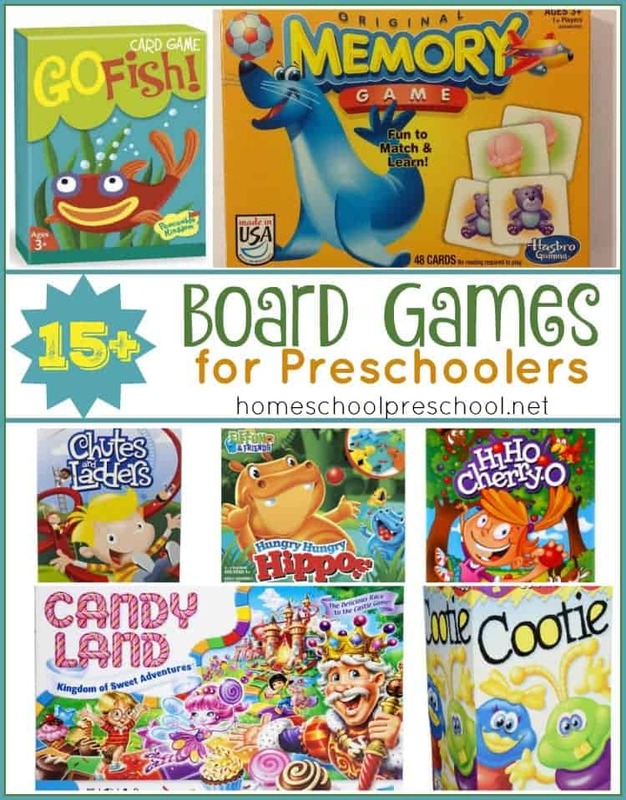 What is your favorite game to play with your preschoolers?